The Serbian people receiving General Mihailovich in a village in Doboj in Northern Bosnia and Hercegovina, October 1944. 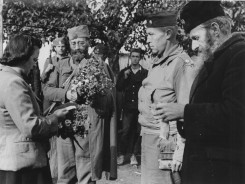 General Draza Mihailovich is receiving the flowers from the young lady and American Lieutenant Colonel Robert H. McDowell of the OSS “Ranger Mission” is standing to the left of Mihailovich, holding the general’s coat. “The ideal liaison officer assigned to Yugoslavia in World War II theoretically would have had (1) a knowledge of Yugoslavia and her peoples, (2) an understanding of Yugoslav politics, (3) fluency in the Serbo-Croatian language, (4) a knowledge of Yugoslav history and of wartime developments in Yugoslavia, (5) an experienced perception of the world situation and, in particular, an understanding of the nature and tactics of communism, and (6) actual experience in both intelligence and guerrilla warfare. No single officer, needless to say, possessed all of these attributes. But of all the British and American officers who were sent into Yugoslavia during World War II, Lieutenant Colonel Robert H. McDowell came closest to the mark.